Good day, everyone! Today, I’ll be providing my retrospective post for 2016, much like my fellow bloggers here at Comparative Geeks have been doing. An initial disclaimer: these are merely my opinions and are not intended to be absolute declarations of quality or worth. Also, there won’t be much “worst of” in my post, being as I tend to avoid spending money on things I don’t think I will enjoy. Let’s jump right in! I have a massive to-be-read list, so I haven’t gotten to read much actually published in 2016, but this piece stands out. The titular Black Tom is a young jazz guitarist living in 1920s Harlem who moonlights as a thief and dealer of occult items—a somewhat lucrative side gig until he crosses paths with a man attempting to wake a certain well-known elder god. If you’re a fan of modern entries in Lovecraft’s mythos, this one is not to be missed. 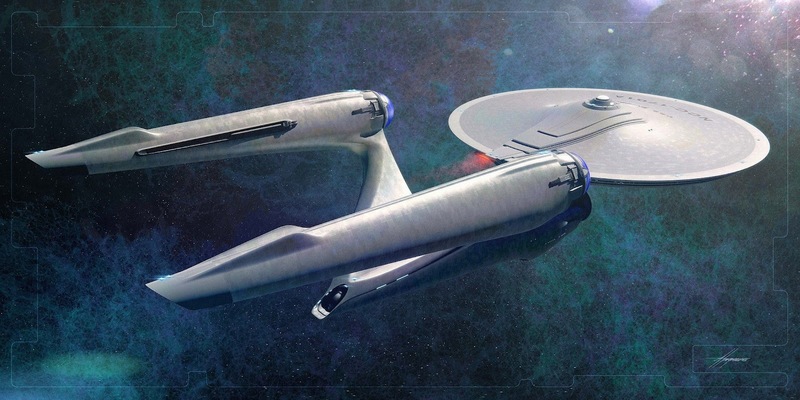 Enterprise-A concept art taken from here. Now, I’m as much of a superhero movie fan as anyone, but my picks for this year are the latest entries in my favorite science fiction franchises since childhood. Both are well-crafted and allusion-filled stories of their respective universes, and Rogue One especially reached me as a tale of a band of damaged misfits making supreme sacrifices for a greater good. I’ve been a fan of this intellectual property for years, through books, television, games, and what have you. Regardless of the naysayers, I loved this past season and look forward to what comes next. You should check out my column right here at Comparative Geeks to see my thoughts on this one. I love well-crafted science fiction about evolving artificial intelligence, and this is my favorite sci-fi show since Battlestar Galactica ended in 2009. Saga returned a few months back after a brief hiatus, and Vaughan and Staples’s weird character-driven science-fantasy drama is still just as addictive. Get back on board! For the first time in recent memory, DC is truly giving Marvel a run for its money in the comic book market. Rebirth keeps what worked about the New 52 and reintroduces older concepts and characters established fans have been missing since 2011—the return of the original Wally West and the pre-New 52 Superman paramount among them. The new connections established with Dr. Manhattan and the Watchmen universe are also intriguing concepts that I’m eager to see play out over the next couple of years. I haven’t gotten to play many new games yet (and not very much in this one so far), but I’m giving it to this dieselpunk first-person revenge/stealth sequel. I love this setting! The Rolling Stones’s newest album blends their signature sound with the emotional resonance of the blues. It doesn’t seem like it would work, but it does so well. Also, the instrumental music of the Westworld soundtrack (composed primarily by Ramin Djawadi, of Game of Thrones and Pacific Rim fame) is a great companion for thinking and writing, especially the player piano song covers. 2016 saw some of the most contentious and vitriolic American politics in decades, and the blame for that rests with all of us regardless of slant or belief. I can only hope things will somehow get brighter, and people wiser. And I hope we can truly stem the spread of terrorism and war across the world. Time will tell. We have also lost a seemingly gargantuan number of well-known faces this year: Alan Rickman, David Bowie, Prince, Muhammad Ali, John Glenn, Ron Glass, Kenny Baker, George Michael, Harper Lee, Umberto Eco, now Carrie Fisher and Debbie Reynolds, and many, many others. I’ll be glad when it all finally stops. Thank you all for coming by and reading my thoughts. Let me know your own thoughts in the comments below. Please take care of yourselves this coming year, and keep coming back here to visit. Thanks again!